The Journal of Mammalian Evolution is a multidisciplinary journal devoted to studies on the comparative morphology, molecular biology, paleobiology, genetics, developmental and reproductive biology, biogeography, systematics, ethology and ecology, and population dynamics of mammals and the ways that these diverse data can be analyzed for the reconstruction of mammalian evolution. The journal publishes high-quality peer-reviewed original articles and reviews derived from both laboratory and field studies. The journal serves as an international forum to facilitate communication among researchers in the multiple fields that contribute to our understanding of mammalian evolutionary biology. 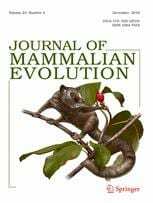 Journal of Mammalian Evolution is the official journal of the Society for the Study of Mammalian Evolution (SSME). The Journal of Mammalian Evolution is published quarterly by Springer. The Society for the Study of Mammalian Evolution has a new web page! You can access it at mammalevolution.com. It includes up-to-date information about the officers and joining the society. More information about the Journal of Mammalian Evolution can be found on the Springer web site.